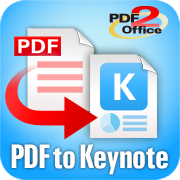 PDF2Office series for iPhone converts PDFs to editable Word, Excel, PowerPoint, Numbers, Keynote, Pages, JPEG and PNG files on the iPhone. 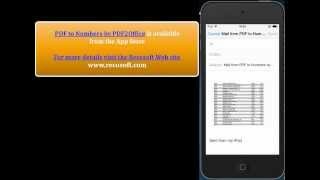 PDF to Numbers converts your PDF to Numbers documents on your iPhone allowing you to reuse the data in Numbers. PDF to Numbers converts a PDF to an editable Numbers file on the iPhone with a few simple taps. Watch how to convert a PDF to Numbers on the iPhone. You can even convert a selected area as a JPEG or PNG image and send it as a new mail attachment. 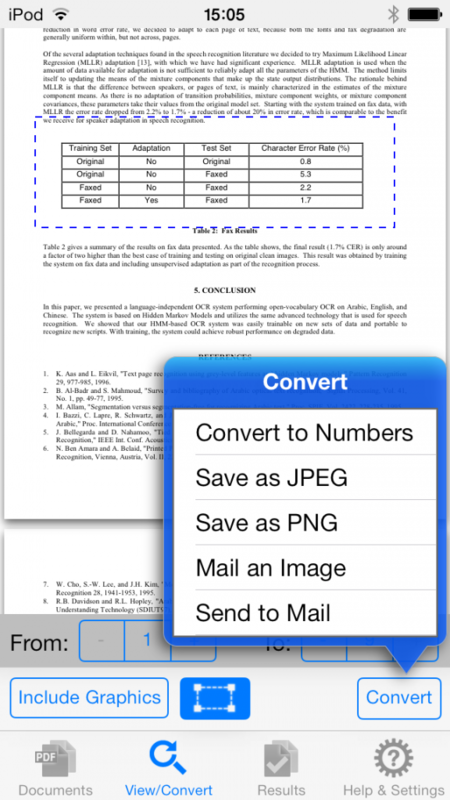 Convert PDF files to editable Numbers, JPEG and PNG types! PDF to Numbers creates tabulated rows and columns when converting to the Numbers format; where the PDF data has been accurately transformed and optimized for use in Numbers. Proper rows and columns are formed allowing you to easily manipulate the data. You can opt to include graphics or leave them out. Dropbox, OneDrive and iCloud integration allows instant download and sharing of files between your iPhone/iCloud services account and other devices seamlessly. You can even use WIFI transfer mode to sync between your Mac/Windows machine. 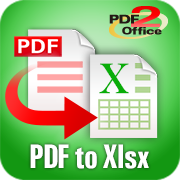 Every Page in a PDF is converted to an equivalent sheet in the resulting Numbers file. You can even mark out a specific area within a page and convert just the required area. 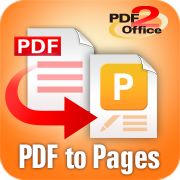 PDF to Numbers by PDF2Office saves you time and allows you to use PDFs on your iPhone productively. Mark a specific area in a page and convert to Numbers, JPEG or PNG. You can even mail the selected area with a simple tap.